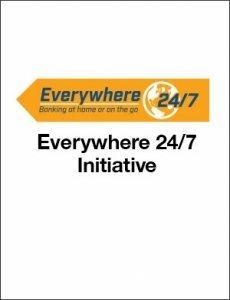 The Everywhere 24/7 Initiative is an ongoing effort to increase the use of Denali Federal Credit Union’s online, mobile and electronic banking services – Everywhere 24/7. Several channels have been used to deploy this message: email announcements, newsletters, branch digital signage, website, ads within online banking, ATM screens, television ads and social media. Examples shown here have been used to build awareness of services and reinforce the Everywhere 24/7 message. I developed the messaging and created and deployed the items shown here with exception of the TV ad below. Download the Everywhere 24/7 Initiative (PDF). Digital sign animation created with stock image. Ad created by ad agency with script provided by me. Created a 30 second TV spot and a 15 second digital audience version.